Wheat is the source of 20 percent of the world’s caloric intake and a dietary staple around the world. It is an excellent source of energy-providing complex carbohydrates, fiber, B vitamins and iron. The U.S. wheat industry is proudly committed to global food assistance and encourages strategies that include the full range of options to help countries attain lasting and sustainable food security. Why do wheat farmers care about food aid programs? U.S. wheat farmers have been partners in U.S. international food assistance programs for more than 60 years, and take pride in sharing their harvest with populations that need it most. Learn more about why wheat farmers care about these programs in U.S. 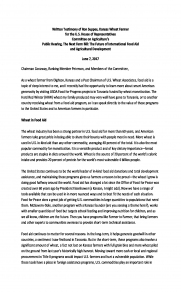 Wheat Associates’ (USW) handouts on food aid and wheat monetization. In 2017, USW board members and state wheat commission staff traveled to Tanzania to see programs using wheat in action. Ron Suppes, a wheat farmer from Kansas, shared his experience and opinion on these programs in his testimony to the House of Representatives Committee on Agriculture, which is shared here. 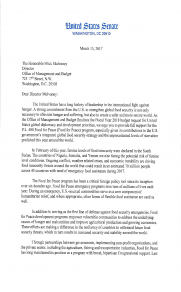 USW has also signed onto many food aid policy letters, which can be found below in the library. How much wheat is donated through food aid programs? The United States donated an average of more than 600,000 metric tons (MT) of wheat as food aid each year from 2012 to 2017. Classes of wheat used as food aid include hard red winter, hard red spring, soft white and soft red winter. The U.S. Agency for International Development (USAID) and the U.S. Department of Agriculture (USDA) also report their commodity usage in the annual International Food Assistance Report. 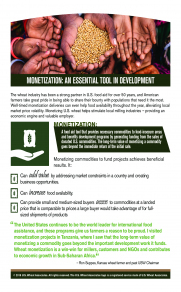 How are wheat farmers involved in food aid programs? Promote wheat as a nutritious component of international food aid. Support funding of P.L. 480 Title II food assistance programs at $2.5 billion, the full amount authorized by law. Support a strong, flexible U.S. food aid program that contains both in‐kind donations and monetization. Support funding and implementation of LRP programs through the Foreign Disaster Assistance Act and USAID. Support USDA administration of Food for Progress. Encourage an increase to the Food for Progress Transportation Cap and efforts to mitigate the effect of Cargo Preference rules on cost recovery calculations. 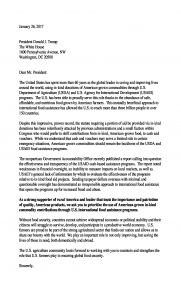 Support the U.S. government’s agricultural development initiatives as a supplement to existing emergency and non-emergency humanitarian assistance programs such as P.L. 480 Title II programs. 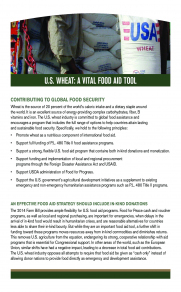 How does USW work with USDA and USAID on food aid? 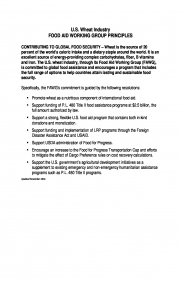 USW works with USAID, USDA and non-governmental organizations on issues impacting the use of wheat in food aid programs. Just as there are different wheat foods, there are different wheat classes and characteristics that are appropriate for those foods. Providing the right wheat to make the most appropriate food for a recipient is a major consideration in food aid donations. Wheat donations do not distort local markets as the vast majority of food aid recipients are net importers of wheat, particularly in Africa, and USW works to ensure that wheat is used appropriately in these programs. How does USW work with NGOs and PVOs? USW works closely with the Private Voluntary Organization/Non-Governmental Organization (PVO/NGO) community to encourage the use of wheat in monetization programs where appropriate. USW provides assistance to PVOs and NGOs looking to monetize wheat with the market characteristics and, most importantly, correct specifications such as protein and moisture content to ensure that each donation is the best fit for that market. NGOs and PVOs submitting proposals for food aid that include wheat in their development projects may request a letter of support from USW and obtain free input on the appropriate wheat class and quality specifications to use for the targeted country by contacting USW Assistant Director of Policy Elizabeth Westendorf. What else is the United States doing to promote food security around the world?